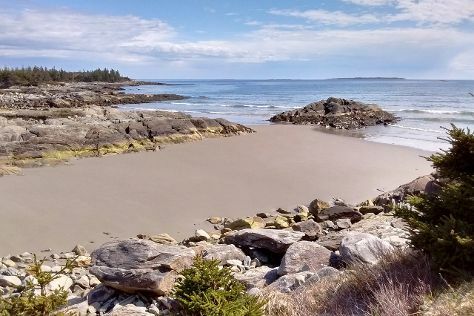 Visiting Clam Harbour Beach and Bay of Fundy will get you outdoors. You'll enjoy a bit of beach vacationing at Lawrencetown Beach and Martinique Beach Provincial Park. Explore Halifax's surroundings by going to Victoria Park (in Truro), Burntcoat Head Park (in Noel), The Ovens Natural Park (in Riverport), Sweet Spot Chocolate Shop (in Elmsdale), Hirtle's Beach (in Rose Bay), Lunenburg (The Lunenburg Makery, St. John's Anglican Church, & more), Luckett Vineyards (in Wolfville), River Rafting & Tubing (in Maitland), That Dutchman's Farm (in Upper Economy), Mahone Bay (Have A Yarn, Haskapa, & more), Peggy's Cove (Swissair Flight 111 Memorial & Peggy's Cove Lighthouse), Masstown Market (in Masstown), Grand-Pré National Historic Site (in Grand Pre), Crystal Crescent Beach Provincial Park (in Sambro), Shubenacadie Wildlife Park (in Shubenacadie) and Clearwater Seafood (in Enfield). Next up on the itinerary: admire the natural beauty at Halifax Public Gardens, take an in-depth tour of Canadian Museum of Immigration at Pier 21, take a leisurely stroll along Halifax Waterfront Boardwalk, and indulge your thirst for a good beer at Alexander Keith's. To see other places to visit, maps, where to stay, and more tourist information, use the Halifax itinerary planner. Use the Route module to find suitable travel options from your home destination to Halifax. Expect a daytime high around 26°C in July, and nighttime lows around 19°C. Finish your sightseeing early on the 11th (Fri) so you can travel back home.